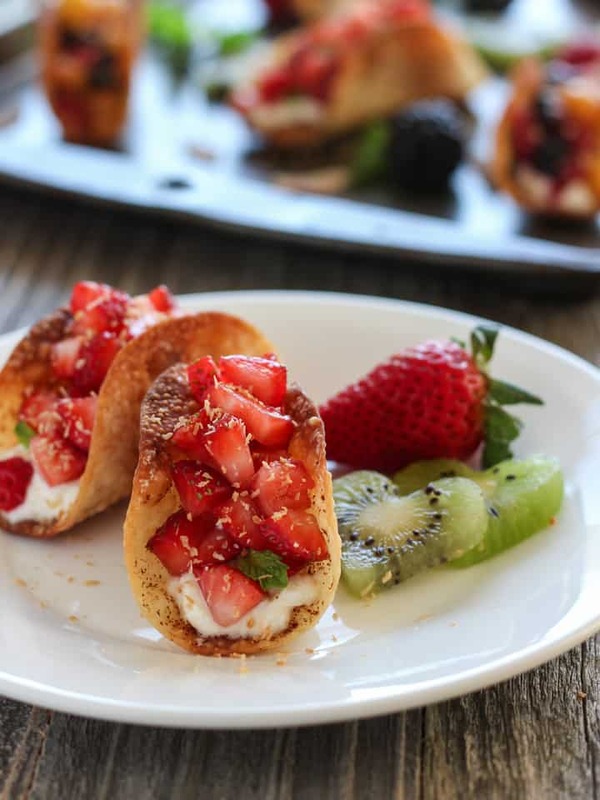 Potsticker Fruit Tacos, the ultimate toaster oven dessert! 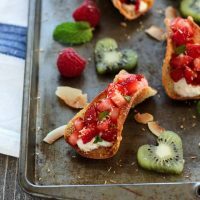 The best part is these crunchy handheld pieces of sweet fruity goodness will take you less than 15 minutes to make. No potsticker wrappers but you’ve got some for wontons? Those will work too. But add potsticker wrappers to your grocery list they are so much easier to make tacos with. The wonton wrapper’s pointy edges tend to flop around willy-nilly leading to a wobbly taco that can’t stand on its own. Not a big deal but isn’t it more fun if your dessert taco can stand up? These taco shells are super easy to make. Just lightly spray or brush them will oil then sprinkle on cinnamon, sugar or both. Place them between the cups of an overturned muffin tin and bake for 5 to 7 minutes. TADA! You just made potsticker taco shells in your toaster oven. If you sprinkle both sides with cinnamon/sugar you will get it all over your hands. Sprinkle just the inside = great flavor and clean hands. One side will always brown faster, rotate the pans for the most evenly crisped shells. They go from done to burnt quickly, watch them closely at the end. If you burn the first batch figuring out your toaster oven’s timing don’t stress. There’s a ton of wrappers in that potstickers package. Now I dare, no double dare you to stop coming up with filling ideas. Or go super dessert style with ice cream and mini chocolate chips. 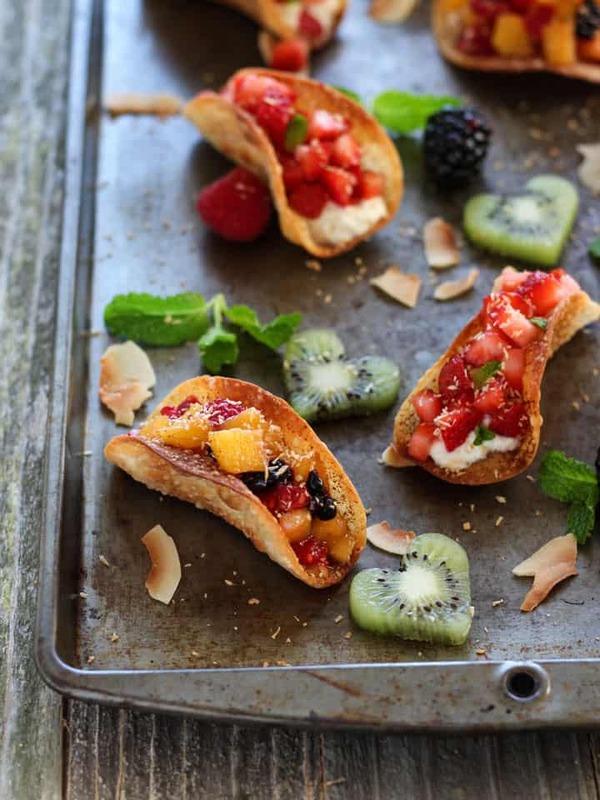 These little fruit tacos are a perfect anytime dessert: weekdays, weekends and for sure Valentine’s Day. The ultimate toaster oven dessert! Less than 15 minutes for these crispy handheld fruit filled treats. Place toaster oven baking rack in the lowest position and preheat to 400 F. Grab a small muffin tin and flip it over. Lightly brush or spray one side of each potsicker wrapper with coconut oil. Flip potsticker wrappers over and repeat. Sprinkle only one side with cinnamon and sugar if using. Place each wrapper between the muffin cups with the cinnamon side facing inward. Bake shells at 400 F for 5-7 minutes until lightly browned, dry and crispy. Allow shells to cool about 5 minutes before filling. While shells bake stir together a few tablespoons ricotta and freshly grated citrus peel. Add spices and sweeteners if desired. 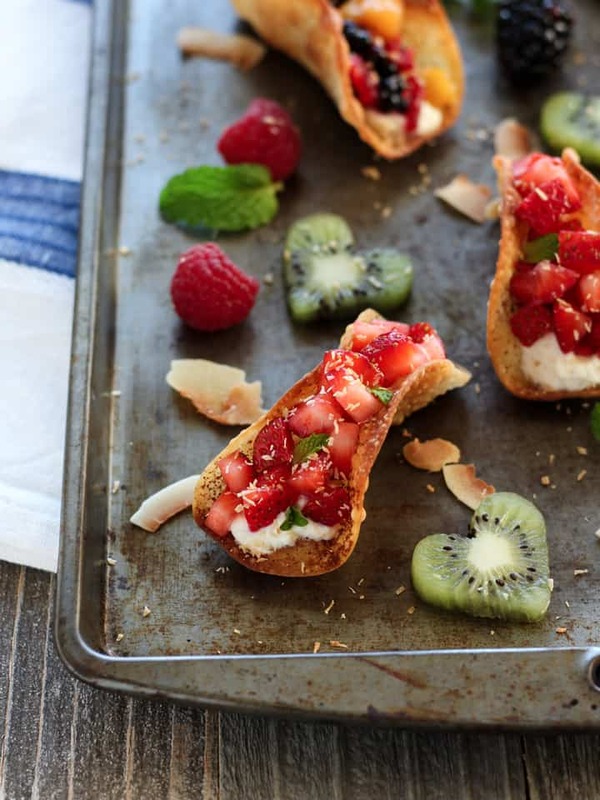 Fill shells with even amounts of ricotta, stuff with fresh fruit, sprinkle with toppings and serve immediately. As toaster ovens vary, start checking on the potsticker taco shells at the 4 minute mark and rotate for even browning. Our toaster oven took almost 7 minutes to brown and crisp the taco shells. The original recipe called for greasing the bottom of the muffin pan, we skipped this step and had no issues removing our baked taco shells. If you run into a sticking issue – try greasing the bottom of the pan before placing the potstickers between the muffin cups and baking. Taco shells method adapted from the Squash and Chard Mini Tacos recipe from Women’s Health. Nutritional information is an estimate for 4 tacos filled with 2 tablespoons ricotta cheese, 1/4 teaspoon clementine zest, 1/3 cup chopped strawberries and 1 teaspoon toasted unsweetened coconut. WOW how cute are these ! What an amazing idea!! These fruit tacos are perfect!! I love these little fruit tacos that is such a great idea. They are two bites of goodness. Nice job on your pictures. 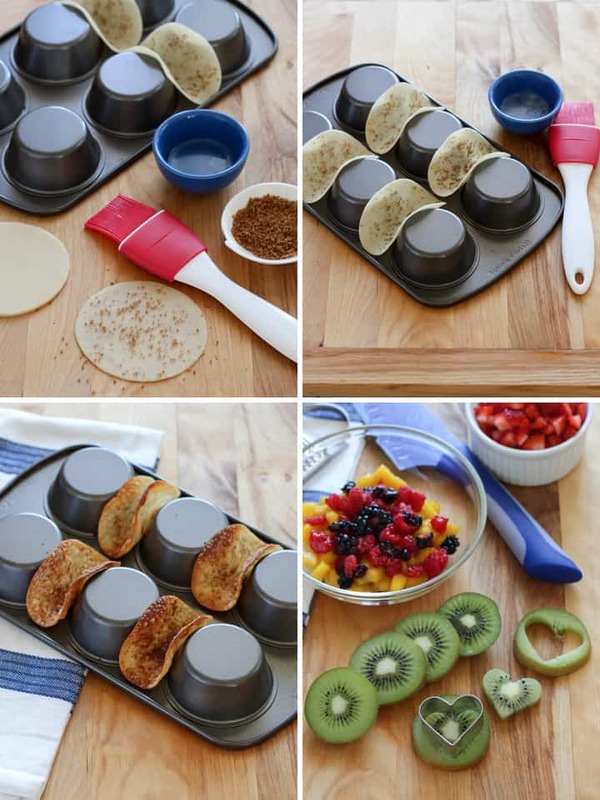 This taco shell using potstickers skin , n invertIng the muffins tin to hold its shape, truly ingenious idea. Will try more if your recipes n visit ofter for sure. These look so lovely, my kids would love them.